PIEDMONT OFFICE REALTY TRUST TO REPORT FOURTH QUARTER AND ANNUAL 2012 FINANCIAL RESULTS | Piedmont Office Realty Trust, Inc.
Atlanta, GA -January 16, 2013 - Piedmont Office Realty Trust (NYSE: PDM), an owner of Class A commercial office properties located primarily in the ten largest U.S. office markets, today announced that the Company will release its fourth quarter and annual 2012 financial results on Thursday, February 7, 2013, after the close of trading on the New York Stock Exchange. An audio webcast and a conference call are scheduled for Friday, February 8, 2013, at 10:00 a.m. Eastern standard time. During the audio webcast and conference call, the Company's management team will review fourth quarter and annual performance, discuss recent events and conduct a question-and-answer period. The playback can be accessed from February 8, 2013 at 2:00 pm through February 22, 2013 at 2:00 pm. Piedmont Office Realty Trust, Inc. (NYSE: PDM) is a fully-integrated and self-managed real estate investment trust (REIT) specializing in high-quality, Class A office properties located primarily in the ten largest U.S. office markets, including Chicago, Washington, D.C., New York, Los Angeles, Boston, and Dallas. As of December 31, 2012, Piedmont's 74 wholly-owned office buildings were comprised of over 20 million rentable square feet. The Company is headquartered in Atlanta, GA, with local management offices in each of its major markets. 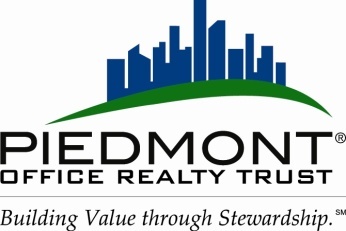 Piedmont is investment-grade rated by Standard & Poor's and Moody's and has maintained a low-leverage strategy while acquiring and disposing of properties during its fourteen year operating history. For more information, see www.piedmontreit.com.